Regular exercise, such as walking, is essential for health and one of the most important things you can do for yourself. Walking is a low-impact, moderate-intensity exercise suitable for nearly everyone. According to the Centers for Disease Control and Prevention, adults should get at least 150 minutes of moderate-intensity exercise every week to maintain and promote health. Consult your doctor before beginning any new exercise regimen, particularly if you have been sedentary or have health concerns. Walking increases your metabolism and burns calories. This can help you lose or maintain weight. How many calories you burn depends on your walking pace, intensity, duration and your weight. 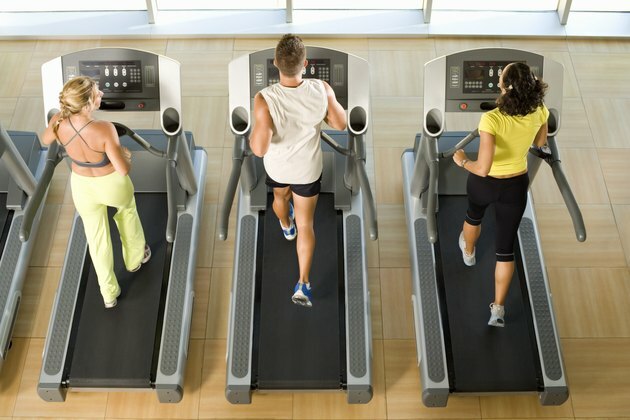 The faster your pace, or the higher your incline, the greater the number of calories you burn. Complete a different program or walk a different route to continue to challenge your body and burn more calories. Varying your workouts also reduces your risk of overuse injuries from walking every day. High blood pressure and blood cholesterol are factors that increase your risk for many diseases and conditions, such as heart disease, stroke, type 2 diabetes and metabolic syndrome. Walking helps decrease your blood pressure and cholesterol and thus reduces your risk for these conditions. Regular walking may also prevent certain cancers, the CDC reports. Your bones are living tissue that is in constant state of remodeling. Your bone strength will decrease with age, which can lead to osteoporosis. Walking is a weight-bearing exercise that puts stress on your bones. Your bones respond to this stress by growing stronger and denser, helping to reduce your risk for osteoporosis. Walking will also strengthen your muscles. When you walk, your muscles work harder than during inactivity -- helping you build muscle mass and increase muscle strength. Aging can make performing everyday physical activities harder; strengthening your muscles will help support your body, improve your physique and prevent falls and other injuries. Walking has benefits for your mental health, too. Regular exercise can improve your thinking, learning and mood by reducing your risk of depression and relieving stress. Walking can also help improve your sleep. Proper sleep is essential aspect of a healthy lifestyle and lack of sleep is associated with many health conditions.